Studies that focus on the biological markers of Autism Spectrum Disorders (ASDs) complement those conducted on behavioural markers. Charting biological markers, such as physical characteristics, hormones, genetic features or brain function, will not only help in facilitating a more objective, and earlier, diagnosis of the ASDs but, importantly, will enhance our understanding of the biological basis of these conditions. Our research in this area vary from investigations into the behavioural and brain markers in infant siblings of children with an ASD, as they are considered to be at high genetic risk of developing an ASD, to studying physical measures such as growth in head circumference and stature. We have found that increased brain growth in early life and enlarged head circumferences are the most consistent early biological markers of ASD identified to date. Other studies are also underway on Fragile-X Syndrome, which is the most commonly inherited cause of intellectual disability. As autism is commonly associated with Fragile-X Syndrome, and the molecular mechanisms underlying Fragile-X Syndrome are well understood, investigations that include people with Fragile-X Syndrome and autism are serving to shed light on the molecular underpinnings of ASDs. Study ID code: KH1. Register for this study using our online form. Study aim: This study is designed to examine early brain markers of ASD in infants who are at high genetic risk for developing this disorder, based on having an older sibling with such a diagnosis. Measurements of brain function may be more sensitive and earlier indicators of risk status. Infants are seen over a number of visits, beginning from four months of age, at the Swinburne BabyLab. Measures of brain response to the various social and non-social stimuli are taken at these repeated visits, following the infants as they get older. From two years of age, these children are seen at OTARC, where various behavioural assessments of social-communication skill, play, language and learning ability are undertaken. Selection criteria for participants: Young infants aged between 4 and 14 months who either have an older sibling with a diagnosis of ASD or, to be in our comparison group, an older sibling without ASD (and with no ASD in extended family members). What is involved for participants: Infants are seen at the Swinburne BabyLab where measures of brain response and visual tracking are taken. In toddlerhood, families attend OTARC where play-based assessments of their developmental level and skills in social interaction, communication, and play are taken. At this stage, we are seeing children until around the third birthday, but we hope to be able to continue following them through later life. Researchers: Andrew Whitehouse (PhD, Telethon Institute and University of Western Australia), Murray Maybery (PhD, University of Western Australia), Cheryl Dissanayake (PhD), Martha Hickey (PhD, Royal Women’s Hospital and University of Melbourne) and C Pennell. To determine whether individuals with a male co-twin, and who were therefore exposed to enhanced levels of androgens in-utero, show increased levels of ASD-like traits in postnatal life. To determine whether the quantitative or qualitative nature of ASD-like traits in a population-based epidemiological sample of adults followed since intrauterine life is associated with prenatal measurements of androgen exposure and head size, and whether these markers are interdependent. To determine whether an increased genetic risk for ASD is associated with prenatal measurements of androgen exposure and pre- and postnatal measurements of head size. whether levels of oxytocin are correlated with the daily rhythm of cortisol in typically developing children who attend daycare and whether this relationship is different for children with an ASD. 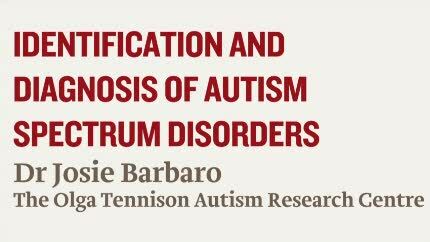 The children participating in this study are attending the Autism Specific Learning and Care Centre and the Community Children’s Centre at La Trobe University. Researchers: Danuta Loesch (PhD), Cheryl Dissanayake (PhD), and colleagues of the Murdoch Children's Research Institute, Melbourne and the MIND Institute at University of California at Davis, Sacramento. Study aim: Autism may occur by itself (idiopathic) or with known genetic disorders such as Fragile X Syndrome, for which the genetic cause is well known. In these studies we compare the behavioural and cognitive profiles between individuals with idiopathic autism and autism associated with Fragile-X Syndrome to shed light on the biological mechanisms involved in the origins of ASDs. Another aim of this study is to explore the possibility that the behavioural and/or cognitive dysfunctions associated with autism are shared by parents of individuals with autism in each of the two groups.